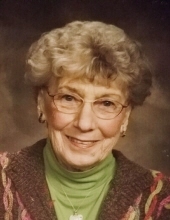 Jean Risk, age 94, Carthage, MO, passed away early Wednesday morning, February 6, 2019 at Maple Tree Terrace, Carthage, surrounded by family. Jean was born September 10, 1924 in Carthage to Roy Carr and Lois C. (Umphlett) Carr. She married Raymond H. Hutchins on November 6, 1945. They had 25 years together, much of that time in Hanford, CA, until his death on November 14, 1970. Jean then married R.J. Risk on October 7, 1972. They had 34 years of marriage, most of that time in Carthage, until his death on September 1, 2006. She was a homemaker and a member of the First Baptist Church in Carthage for over 46 years. Jean was an active member of the CAN DO Senior Center in Carthage, and in the 1980s, also worked at The Ladies Peddler on the square in Carthage. Jean is survived by one daughter, Linda Eaton (Preston), Carthage, MO; two sons, Phil Hutchins (Andrea), Mount Shasta, CA, and Chuck Hutchins (Nancy), Carthage, MO; one sister, Ann Pope, Carthage, MO; one sister-in-law, Jane Carr, Ballwin, MO; five grandchildren, Clinton Eaton (Suzanna), Cabe Eaton, Helena Hutchins, Clayton Hutchins (Ivy), and Samantha Hutchins; and one great-grandchild, Collin Eaton. She was preceded in death by her parents, her two husbands, one sister, Mary Morford, and one brother, Bill Carr. Visitation will be held at 6-7 pm, Friday, February 15, 2019 at Knell Mortuary, Carthage. Funeral services will be held at 2 pm, Saturday, February 16, 2019 at the First Baptist Church, Carthage. Interment will follow the service at Fasken Cemetery, Carthage. Memorial gifts are suggested to the First Baptist Church, Carthage or the CAN DO Senior Center in care of Knell Mortuary. Online condolences may be expressed through www.knellmortuary.com. Arrangements are under the direction and personal care of Knell Mortuary. To send flowers or a remembrance gift to the family of Betty Jean Risk, please visit our Tribute Store. Memorial gifts are suggested to the First Baptist Church, Carthage or the CAN DO Senior Center, Carthage in care of Knell Mortuary. "Email Address" would like to share the life celebration of Betty Jean Risk. Click on the "link" to go to share a favorite memory or leave a condolence message for the family.